The protester who climbed the Statue of Liberty was sentenced to five years probation with no jail time Tuesday morning. Rana Novini reports. The protester who climbed the Statue of Liberty was sentenced to five years probation with no jail time Tuesday morning. Therese Okoumou was sentenced in a Lower Manhattan court after she was found guilty of misdemeanor charges in December after her protest climb of the Statue of Liberty July 4. The stunt led to the evacuation of Liberty Island. She faced up to 18 months in jail. Prosecutors recommended she get at least 30 days in jail followed by 3 years of probation. They argued that that prison time was necessary because Okoumou scaled structures three additional times following the July 4 incident, including a detention center in Texas for which she faces six months in jail. Okoumou arrived at the courthouse Tuesday with clear tape completely covering her face. Supporters rallied outside chanting "No hate. No fear. Immigrants are welcomed here" as she made her way to learn her fate. Okoumou wore a jacket with white lettering that read "I REALLY DO CARE" as she was escorted through the crowd. Okoumou's jacket could be interpreted as a reference to the one the first lady Melania Trump wore on her way to visit a facility for migrant children last June. The first lady's jacket read: "I really don't care, do u?" It is not the first time Okoumou wore an outfit apparently referencing the first lady's jacket. Once she reached the steps to enter the courthouse Tuesday morning, Okoumou signaled the crowd to continue chanting. The fact that Okoumou had her face completely covered with tape delayed getting her through security and to the courtroom. Once inside, the judge ordered her to remove it before they proceeded. She did. During her sentencing, Okoumou said that she does not belong in prison because she is not a criminal. She also said she will continue to fight in prison if she were to be sentenced to serve time. Earlier this month, judge changed the terms of her bail, ordering Okoumou to home detention to be enforced by electronic monitoring. As part of her sentencing, her electronic monitoring will be removed so she can go to work at an art institute. Prosecutors previously sent U.S. Magistrate Judge Gabriel Gorenstein a letter asking for a hearing to decide whether Okoumou’s bail should be revoked following her arrest in Texas on Feb. 20. Okoumou was arrested for criminal trespass in Travis County after she climbed a building and hung a banner that said “Abolish ICE” on it to protest federal immigration policy. 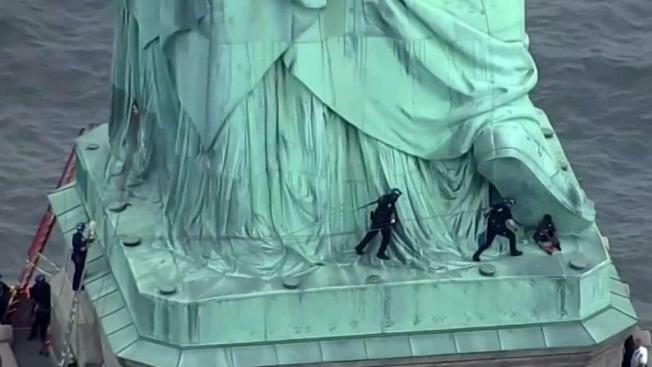 Okoumou made the climb on Lady Liberty to protest President Donald Trump's immigration policies, specifically the separation of families at the southern border.